Dan Snyder’s latest open letter about why he is not changing the name of his football team and his new foundation for Native Americans beggars belief. Below are passages from the instantly infamous open letter that Dan Snyder just sent to “Redskins Nation” announcing his new charity organization, “The Washington Redskins Original American Foundation.” People can read the entire letter here. In addition to being profoundly offensive, the letter is also repetitive and turgid, so I only reproduced “the best” parts below. My comments are in bold. Note of caution: this letter was written under the council of team advisors George “Macaca” Allen, Ari Fleischer and Lanny Davis. They are like 1927 Yankees of wretched Washington DC lobbyists, people whose fingerprints on wars, occupations and dictators would keep the Hague busy for the next decade. If you can’t stand Beltway culture, if the thought of well-heeled lobbyists oozing from one five-star steak house to the next turns your stomach, just realize that these are the people who thought the below letter was a good idea. Several months ago I wrote you about my personal reflections on our team name and on our shared Washington Redskins heritage. A heritage marked by being the last team in the NFL to integrate and a heritage that was launched by the proudly racist and arch segregationist minstrel lover, George Preston Marshall. He is, to use the parlance of the moment, on the Mt. Rushmore of evil bastards in sports history. I’m starting to think that Snyder wants to knock him off of his perch. I wrote then—and believe even more firmly now—that our team name captures the best of who we are and who we can be, by staying true to our history and honoring the deep and enduring values our name represents. To be “true” to your “history,” you would need to make your coach wear feathers in his hair, lie about him being Native American and then trade away all of your black players. The “values” the name represents can be summed up in a story I heard from a young woman named Mary from the Omaha Nation who spoke about how it would be shouted when bullies would hurt her at school. Her narrative and the narratives of others actually damaged by this name never enter Snyder’s consciousness. In that letter, I committed myself to listening and learning from all voices with a perspective about our Washington Redskins name. This is a lie. Daniel Snyder has actually refused to meet with the Oneida Nation, the Choctaw Nation, the Red Cloud Nation, the Seminole Nation and every tribal council that has voted to call upon Snyder to change the name. What would my resolve to honoring our legacy mean if I myself—as the owner of and a passionate believer in the Washington Redskins — didn’t stay true to my word? So over the past four months, my staff and I traveled to 26 Tribal reservations across twenty states to listen and learn first-hand about the views, attitudes, and experiences of the Tribes. We were invited into their homes, their Tribal Councils and their communities to learn more about the extraordinary daily challenges in their lives. Some of my BEST FRIENDS… are, um, Pueblo of Zuni Governors. The more I heard, the more I’ve learned, and the more I saw, the more resolved I became about helping to address the challenges that plague the Native American community. In speaking face-to-face with Native American leaders and community members, it’s plain to see they need action, not words. In other words, people who speak out about the name are only concerned with “words,” not action. Could it be possible that the problems in the Native American community are linked to mascoting and branding them with a dictionary defined racial slur? The oldest Native American civil rights organization, the National Congress of American Indians, certainly thinks so. But, alas, Dan Snyder did not meet with them. Yes, some tribes are doing well. And in our candid conversations, we learned that we share so much with Indian country. We find their appreciation of history, legacy, caring for their elders and providing a better future for their youth inspirational and admirable. Sorry to veer off subject, but news that Dan Snyder and his team “cares for elders” would be news to Pat Hill, a senior citizen and lifelong fan, who Snyder and his minions drove into bankruptcy court when she could no longer afford her season tickets. They did back down after a tidal wave of disgust. But the fact is, too many Native American communities face much harsher, much more alarming realities. They have genuine issues they truly are worried about, and our team’s name is not one of them. Yes, people who don’t want the team named after a racial slur are actually part of the problem. But give Dan Snyder this: he is one of our countries finest trolls. This is some world class trolling. Speaking of “heart-wrenching” this is a good time to remind the reader that Washington football legend John Riggins once described Dan Snyder by saying “this person’s heart is dark.” Evidence of his lack of regard for others abounds. 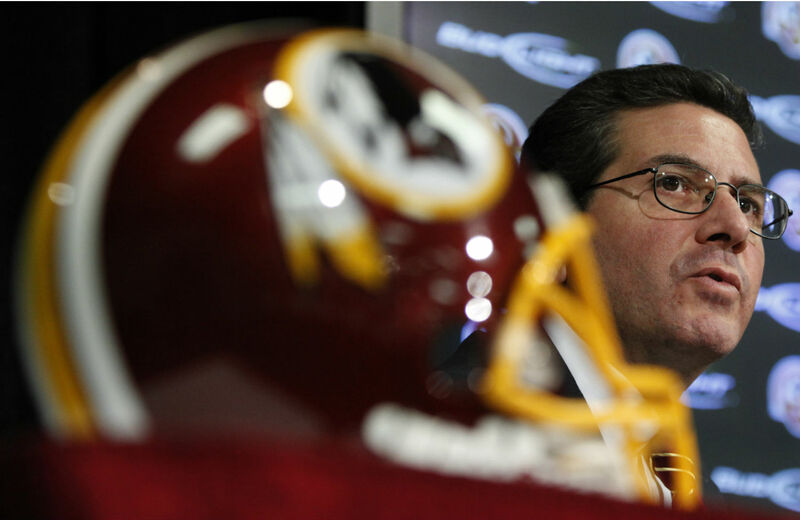 Do you want to hear awful things about Dan Snyder? Ask a waiter, a driver, a low wage worker who ever had the temerity to make eye-contact with the man. I want to do more. I believe the Washington Redskins community should commit to making a real, lasting, positive impact on Native American quality of life—one tribe and one person at a time. I know we won’t be able to fix every problem. But we need to make an impact. Then change the damn name. And so I will take action. Slate magazine described this name as being akin to “Kikes Against Anti-Semitism.” Others have asked the obvious question: if the name isn’t offensive, why not just call it The Washington Redskins Redskins Foundation? The mission of the Original Americans Foundation is to provide meaningful and measurable resources that provide genuine opportunities for Tribal communities. With open arms and determined minds, we will work as partners to begin to tackle the troubling realities facing so many tribes across our country. Our efforts will address the urgent challenges plaguing Indian country based on what Tribal leaders tell us they need most. We may have created this new organization, but the direction of the Foundation is truly theirs. The Washington Redskins Original Americans Foundation will serve as a living, breathing legacy—and an ongoing reminder—of the heritage and tradition that is the Washington Redskins. I’m glad to be able to launch this vital initiative today. We’ll let the last word here be from Rep. Betty McCollum, Democratic co-chair of the Congressional Native American caucus, who said the NFL and its Washington franchise “have exploited a racist Indian caricature, turning it into a billion dollar brand while completely ignoring the needs of real Native American children, families, and elders. Now, team owner Dan Snyder wants to keep profiting from his team’s racist brand and use those profits to attempt to buy the silence of Native Americans with a foundation that is equal parts public relations scheme and tax deduction.” That about sums it up.